Cotchett, Pitre & McCarthy has been participating in the Americans Supporting Americans ("ASA") Program. ASA provides the opportunity for organizations to support the morale of troops serving in military units serving overseas. In times of these wars a strong connection with our troops has proved dynamically and richly rewarding to the troops. Traditionally, units deployed abroad serving in harms way, count on letters and care packages to boost morale and help them feel connected to home. CPM is honored to foster Alpha Troop 1st- 75 Cavalry, 2nd Brigade Combat Team from the famed 101st Airborne Division (Currently in Kandahar Province, Afghanistan). CPM has sent to Alpha Troop approximately 350 lbs. of various items from chow mein to toothbrushes. 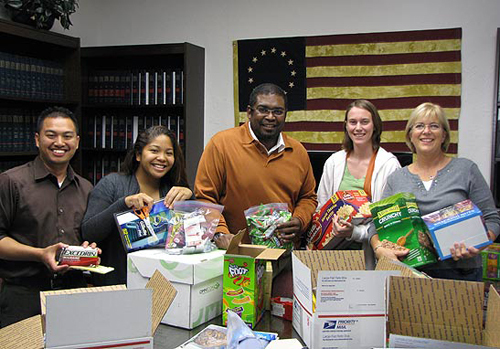 CPM will be sending Alpha Troop more care packages in time for the holidays.